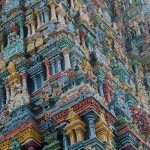 Exquisite Meenakshi Amman Temple in India can impress anyone who ever saw it, without making exceptions. 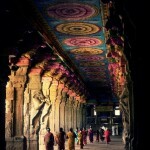 Even such experienced and sophisticated traveler as Marco Polo could not help praising its delightful architecture. 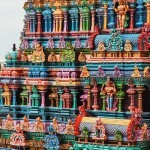 The Temple listed among New Seven Wonders of the World is true work of architectural art. 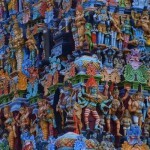 33 thousand magnificent sculptures, painted in bright colors cover the walls and pillars from top to bottom. 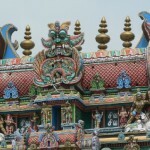 Besides, the temple is the center of education, culture, literature, art, music and dance for Tamil people. 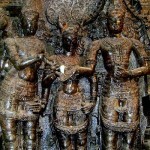 Among the prominent people depicted in carved figures – Rati (wife of Kama), Karthikeya, Ganesha, Shiva, and many more. 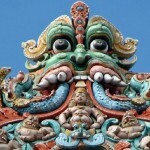 And of course, alongside with them – endless number of mythical figures of yali – beast with body of lion and head of an elephant. 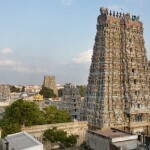 The Temple includes Art Museum exhibiting icons, photographs, drawings, and other exhibits of the 1200 years old history of the temple. 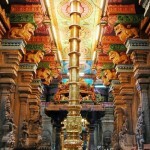 And among the most interesting objects of the temple are the Musical Pillars, which produce a different musical note when struck. 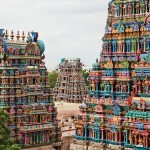 Beautiful Meenakshi Temple, or Meenakshi Sundareswarar Temple stands on the left bank of the Vaigai River, in the city of Madurai, in the Indian state of Tamil Nadu. 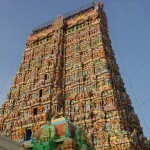 Built in honor of Goddess Parvati (Meenakshi) and her husband Shiva, known in this part of the country as Sundareswarar. 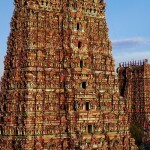 In fact, Meenakshi Temple is a huge complex of buildings, which covers a vast area right in the heart of Madurai. To enter it is possible through one of the four existing gates. 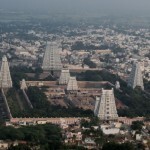 The complex consists of fourteen towers, called gopurams. 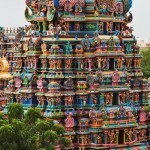 Each Gopuram is towering 45-50 meters above the ground, built around a beautiful pond. 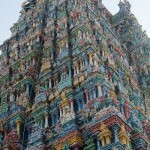 The biggest Gopuram – South Tower – has a height of 52 meters. 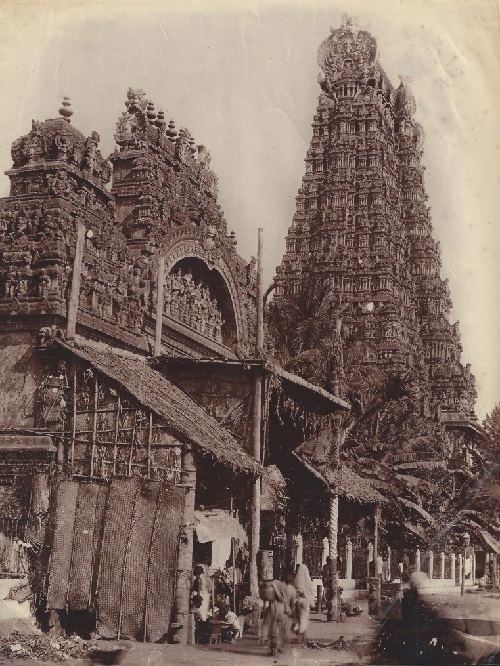 And the oldest is the eastern Gopuram, built in 1216-1238. 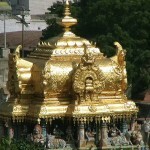 Also, on the site are two large gold Wimans – sculptural tower pavilions, which house the main shrine of the temple. 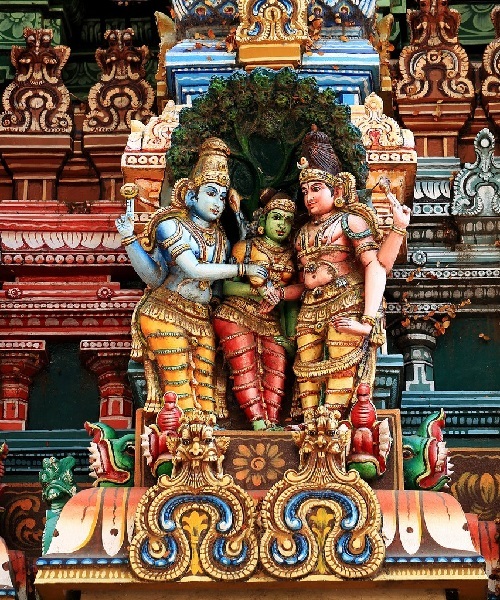 On one Wiman – carved from black stone with an emerald tint the image of the Goddess Meenakshi, the other – a sculpture of Sundareswarar. 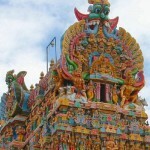 In addition to Parvati and Shiva, the temple worships Lord Ganesha, placed near the Sundareswarar Wiman. The church is not only a tourist attraction but also an important religious place, where in addition to foreign travelers can be found faithful. 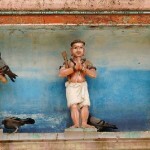 50 priests perform the puja (rituals) in the temple during festivals and on a daily basis. 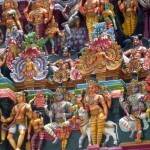 According to ancient legend, the goddess Meenakshi had eyes in the form of fish and was undefeated in battle. In 1310, Muslims almost completely destroyed this delightful church, when conquered the land, the same they did with almost all the temples of other religions. 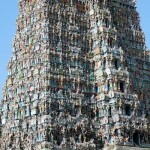 However, towards the end of the XIV century regaining the throne Hindu kings completely restored it. 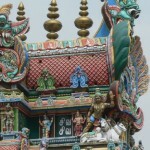 Because of its special status, and the convenient location of the Temple, here take place city festivals. 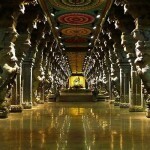 Since this place is very important for pilgrims, thousands of people visit it every day. 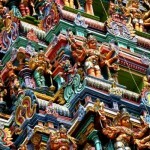 The temple of Parvati has a cabin – a place where a woman can step, but entering of man is strictly prohibited. 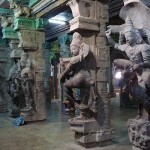 All the sculptures that you can see here, tinted and carefully restored every 12 years. Despite the fact that after the last recovery, the age of this church is only slightly more than 400 years, its history is 2,000 years.